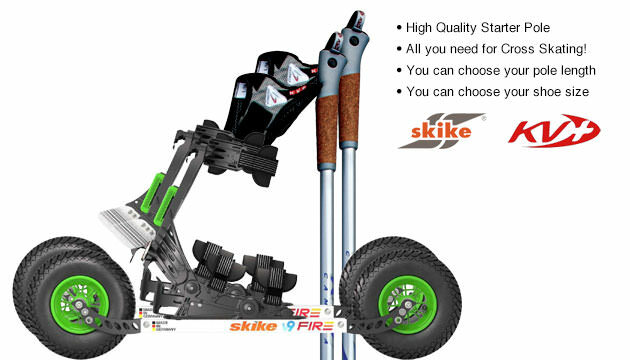 The Skike v9 FIRE is a complete new development by Skike. Use your own shoes. Equipped with several quick release levers and high-end belts Skike v9 FIRE is a very comfortable cross skates for beginners and advanced skaters. Skike v9 FIRE 200 is a complete new design by Skike. It comes with large 8 inch (200 mm) air tires including reverse lock bearings on two tires. Skike v9 has a newly developed multifunctional heel lift system that allows classic and skating technique. When you would like to do classic technique you unlock the mechanism and your heel can go up. Like all Skike skates you use your own shoes with them. A comfortable binding system holds your foot very comfortabely.